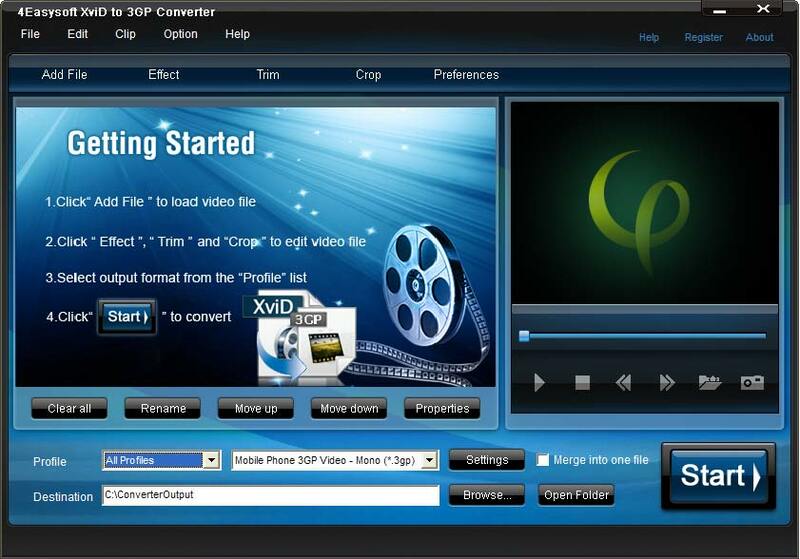 More additional, this XviD to 3GP Converter can also convert MP4 AVI video to audio formats AAC, AMR, MP3, M4A, etc. The powerful editing function can help you to recreate your video to perfect fit for your Mobile Phone: adjust video effect, crop the video play region and capture video clips and watermark on video, etc. 4Easysoft XviD to 3GP Converter accepts AVI, MPEG4, MPEG.4 HD video, MP3, MP2, WMA audio and convert them to 3GP, 3G2, MP4, AVI, MOV, MPG video and AAC, AMR, MP3, M4A, WAV, WMA audio. It gives advanced users the ability to finish multiple output formats conversions from source with schedule at one time . Provide you to add Text or Image watermark for your video. In this way, you can adjust the position, transparence, font style, etc features. 4Easysoft XviD to 3GP Converter is available to choose your preferred subtitle and Audio track. With friendly user-interface, 4Easysoft XviD to 3GP Converter can be easily operated by both the experience user and the beginner and get the perfect effect easily. It is available for you to add watermark for video. Output different formats from inputting files at one time conversion. Choose subtitle and audio track if needed. Convert DVD to DivX, XviD.